Oh sweet elephant, I can so relate. 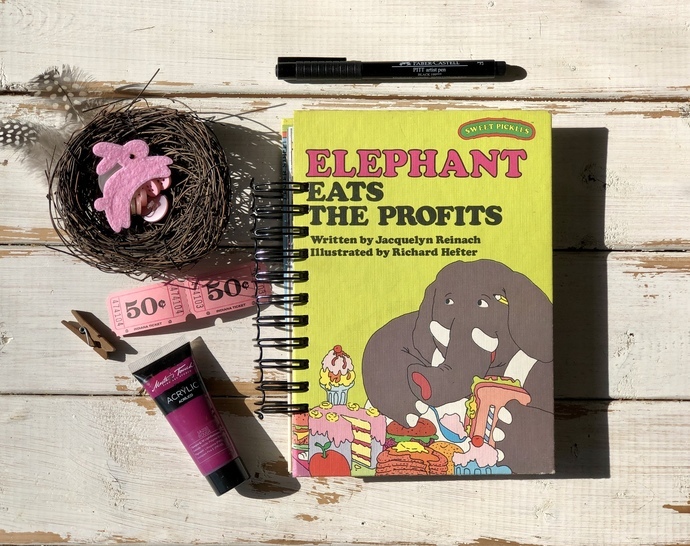 This cute cover is from a 1977 book that is part of the Sweet Pickles series, Elephant Eats the Profits. This journal is the perfect size to tuck into a bag to bring with you wherever you go. There are 50+ vintage book pages and 50+ blank pages. The blank pages are a mix of vintage blank pages from books, tea stained pages, graph paper, dot paper, notebook paper, card stock, Kraft paper, and quality heavier weight computer paper. There are at least three envelopes made from vintage book pages, as well as a few pocket and tuck spots throughout. Most pages are left without embellishment to let you truly make it your own with your unique creative process. This repurposed journal would be great for using as a travel journal, junk journal, scrapbook, planner, prayer journal, art journal, garden journal or just as a place to jot down your thoughts. I have used my own for pretty much every purpose I just listed. The size is 8.5” x 5.5” not including the wire binding. The wire binding allows the book to lie flat.